Photographer John Pannell was among the crowds who gathered in The Mall to witness Trooping the Colour on Saturday. Traditionally held to mark the Queen’s birthday, this year’s event – in honour of the fact that the Queen has turned 90 (her actual birthday being 21st April) – was followed on Sunday by a lunch for 10,000, known as the Patron’s Lunch, in The Mall. 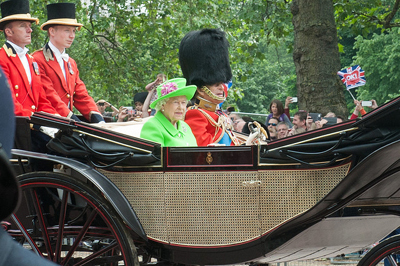 Trooping the Colour has marked the official birthday of the sovereign since the reign of King George II. Above are the Queen and Prince Philip while below are part of the Massed Bands of the Household Division, among those who marched, and, RAF planes fly-past Buckingham Palace while watched from the palace’s famed balcony by the Queen and the royal family. 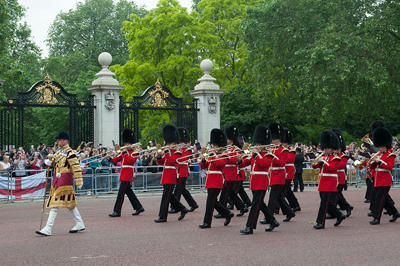 • It’s another weekend of celebration in London with events including Trooping the Colour and the Hampton Court Palace Festival taking place. 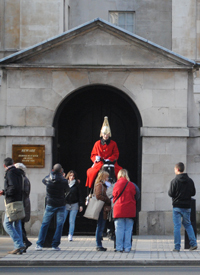 With Diamond Jubilee fever in the air, expect crowds for this year’s Trooping the Color – the annual celebration of the Queen’s birthday – held at Horse Guards Parade on Saturday. 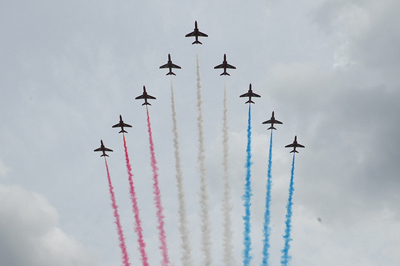 The procession down The Mall kicks off at 10am with the flypast back at Buckingham Palace at 1pm (organisers advice getting your place by 9am – for more, follow this link). The Hampton Court Palace Festival, meanwhile, kicks off today with a performance by Liza Minnelli and runs through next week until John Barrowman performs at the festival’s closing next Saturday (24th June). The festival, set against the backdrop of Hampton Court Palace, this year celebrates its 20th year – among other performers are Van Morrison, James Morrison, Frankie Valli & The Four Seasons and this Saturday (16th June) sees the holding of the 20th Anniversary Classical Gala and fireworks. For more, see http://hamptoncourtpalacefestival.com/. 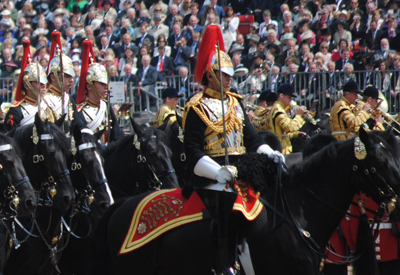 PICTURE: Trooping the Colour 2011. • Park Lane’s central reservation is now hosting three new large scale sculptures by artist William Turnbull, considered a pioneer of modernism. The three works – 3×1 (1966), Large Horse (1990) and Large Blade Venus (1990) – have been installed as part of Westminster City Council’s ‘City of Sculpture’ festival. The works are on loan from the artist as well as the Yorkshire Sculpture Park and Chatsworth House, where they have been recently displayed. • Professor Keith Simpson, a pathologist who has conducted post-mortems as part of the investigation into some of the country’s most infamous murders, has been honored with a green plaque at his former residence at 1 Weymouth Street by Wesminster City Council. The cases he worked on include the 1949 Acid Bath Murders (John George Haigh was hanged for the murder of six people in August that year) and the murder of gangster George Cornell, shot dead by Ronnie Kray in Whitechapel’s Blind Beggar Pub in 1966. Professor Simpson, who died in 1985, worked in the field of pathology for more than 30 years, taught at Guy’s Hospital in London and was renowned as having performed more autopsies than anyone else in the world. • Now On: Londoners at Play. This exhibition at the Getty Images Gallery in Eastcastle Street explores through images how Londoners spent their leisure time – from the 19th century through to today. The display features 57 images including an image of ‘Last Night of the Proms’ from 1956 featuring conductor Sir Malcolm Sergeant, a print taken from a glass plate negative showing Londoners cycling in Royal Parks in 1895 and a crowd watching a Punch and Judy show in Covent Garden in 1900. Admission is free. Runs until 25th August. For more, see www.gettyimagesgallery.com/Exhibitions/Default.aspx. • Now On: Gold: Power and Allure – 4,500 Years of Gold Treasures from across Britain. This exhibition at the Goldsmith’s Hall showcases more than 400 gold items, dating from 2,500 BC through to today. Admission is free. Runs until 28th July. For more information, see www.thegoldsmiths.co.uk. For many Londoners, an opportunity to see the Queen means heading to Buckingham Palace to watch her wave from the balcony – or standing in the Mall to watch as her carriage goes by. Given that, we thought we’d take the time to have a quick look at the history of The Mall, an important player in events like the annual Trooping the Colour. This one kilometre long grand processional route which links Trafalgar Square to Buckingham Palace, was originally cut through St James’s Park in 1660 when King Charles II was looking for a new paille-maille pitch (see our earlier entry on Pall Mall for more on this). Two long avenues of trees were planted on either side, giving it a leafy feel that’s still in evidence today. The Mall had become notorious by the 18th century and was spruced up in 1911 under the eye of Sir Aston Webb (who also designed other elements in the area including a new facade for Buckingham Palace, the Queen Victoria Memorial in front of the palace, and Admiralty Arch at the western end of the route) to become the grand avenue, complete with red-carpet like surface (this was done later), that it is today. It is bordered by St James’s Park on the south side and on the north side is overlooked by various grand buildings – including Clarence House and the Institute of Contemporary Arts – as well as, toward the western end, Green Park. These days the Queen publicly processes down The Mall for a number of events throughout the year – among them are the State Opening of Parliament (held earlier this month) as well as military ceremonies like Trooping the Colour and events like last year’s Royal Wedding when is it said that more than a million people were said to have filled the broad street. 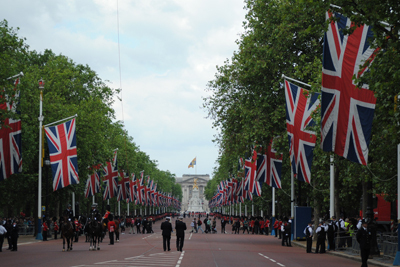 The Mall is also the route along which Heads of State process in a horse drawn carriage during official visits (the road is then decorated with Union Jacks and flags of the visitor’s country). During the Olympics, it will be the start and end location of the marathons and cycling road races. Apart from the Queen Victoria Memorial at the eastern end of The Mall, statues and monuments lining the road include the Queen Mother Memorial, a statue of explorer Captain James Cook, and a recently installed statue of cosmonaut, Yuri Gagarin. There are apparently a series of tunnels underneath with link Buckingham Palace with Whitehall. 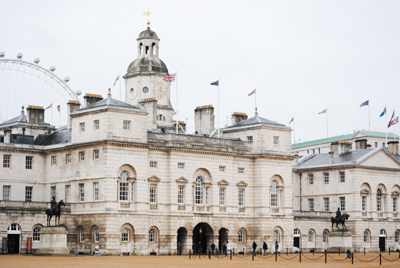 We should also briefly mention Horseguards, which is at The Mall’s eastern end and where Trooping the Colour and Beating Retreat takes place. This was formerly the site of a tiltyard of the Palace of Whitehall and jousting tournaments were held here during the time of King Henry VIII. It has been used for parades and ceremonies since the 17th century. While cars were parked here for much of the 20th century, this practice was stopped in the mid-1990s. 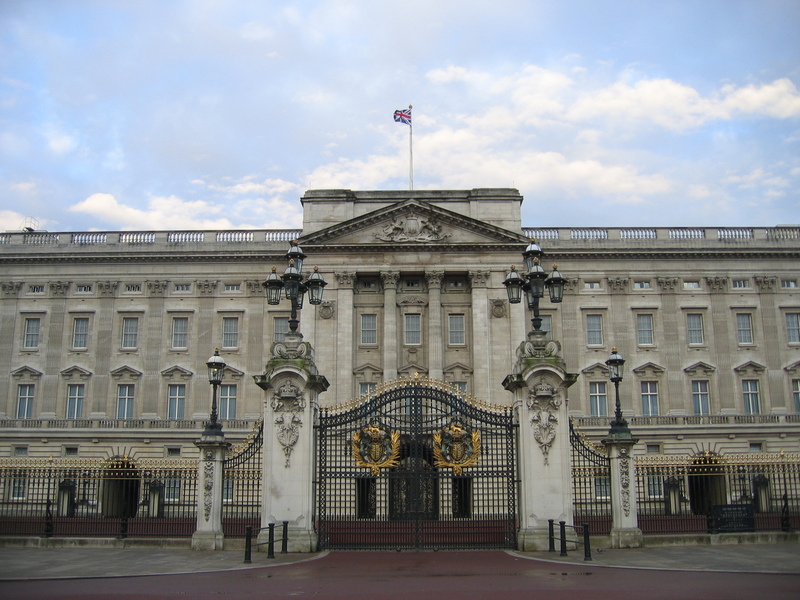 Following her coronation, Queen Elizabeth II and Prince Philip, the Duke of Edinburgh, took up residence in Buckingham Palace and have resided there ever since. The Queen and her family’s appearance on the palace’s balcony to wave to crowds at events like Trooping the Colour and last year’s Royal Wedding have become symbols of her reign. We’ve already written about some of the history of the 775 room palace (see our earlier post here), so today we’re looking specifically at the palace as the residence of Queen Elizabeth II. While the focus for visitors to the palace is on the grand state rooms (of which there are 19 located in the west block facing the palace gardens – they include the Throne Room and State Dining Room), the Queen and the Duke of Edinburgh live in private apartments on the north side of the palace while rooms on the upper floors of the palace’s north and east sides are occupied by other members of the Royal Family. A large part of the ground floor and palace’s south wing are occupied by service quarters and members of the Royal Household. 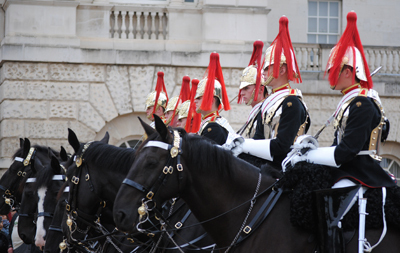 As well as weekly meetings at the palace – including audiences with the Prime Minister, foreign and British ambassadors, clergy and senior members of the civil service, the Queen also hosts a variety of grand events at the palace throughout the year. These include the Diplomatic Reception given for members of the diplomatic corps in the autumn (more than 1,500 people attend from more than 130 countries), three large garden parties in the summer and grand State Banquets which are held in the Ballroom on the first evening of a visit from a foreign head of state. The Queen is also noted for the small private lunch parties she holds to which community leaders are invited. The head of the 1,200 strong Royal Household is the Lord Chamberlain (since 2006 The Earl Peel), a non-political office responsible for the organisation of ceremonial activities at court as well as the palace’s upkeep. Under him are the various departments heads – these include the Comptroller, who heads the Lord Chamberlain’s Office (this oversees everything from State Visits to the Royal Mews), the Keeper of the Privy Purse (responsible for the management of the sovereign’s financial affairs) and the Master of the Household (responsible for domestic and staff arrangements as well as catering and official entertainment, this position dates back to 1539). A typical day in the life of the Queen when at the palace involves her spending the morning at her desk where she reviews a sample of incoming letters (an estimated 200 to 300 arrive each day almost all of which are answered by her staff) and meets with her Private Secretaries to deal with official papers which arrive in the famous ‘red boxes’. The Queen will then often hold a series of audiences during which she’ll meet with a range of people – from retiring senior members of the armed forces to newly appointed ambassadors and judges and people who have won awards for excellence in a particular field. She may then participate in an investiture at which honors and decorations are presented (about 25 of these are held every year, usually in the palace Ballroom). Lunch is often private although as previously mentioned, the Queen and Duke of Edinburgh are known for hosting small lunch gatherings for a range of people. In the afternoon, the Queen will often attend engagements outside the palace (she attends about 430 engagements and audiences a year) before possibly meeting with the Privy Council. Evenings are spent reviewing a report of the day’s parliamentary proceedings, meeting with the Prime Minister (something she does every Wednesday when both are in London), attending further engagements or hosting events at the palace. And, of course, when the Queen is in residence, Buckingham Palace is also home to the Queen’s corgis – Monty, Willow and Holly – and dorgis (a cross between a corgi and a dachshund) – Cider, Candy and Vulcan. 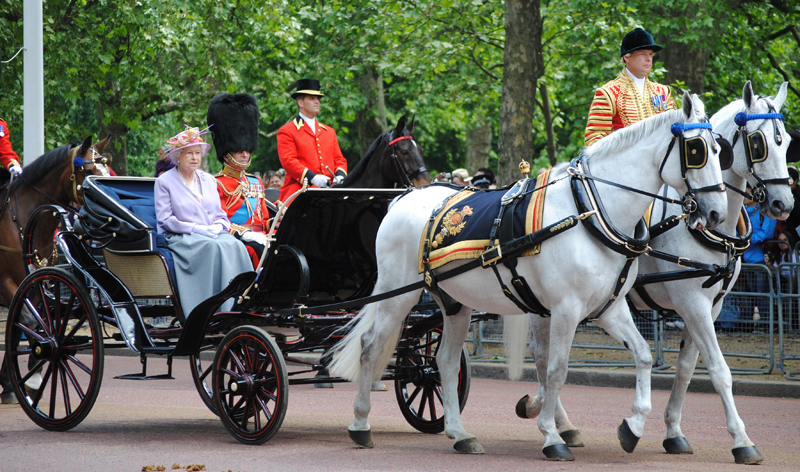 For more on Buckingham Palace and the life of the Queen, go www.royal.gov.uk. WHERE: State Rooms, Buckingham Palace (includes special exhibition Diamonds: A Jubilee Celebration) (nearest Tube stations are Victoria, Green Park and Hyde Park Corner); WHEN: 9.45am to 6.30pm, 30th June to 8th July and 31st July to 7th October; COST: £18 an adult/£10.50 a child (under 17s/under fives free)/£16.50 concession/£47 family; WEBSITE: www.royalcollection.org.uk/visit/buckinghampalace.